June marks the 20th anniversary of England getting their hands on silverware when the side won Le Tournoi in France. Today we look back at that competition, as Glenn Hoddle’s side surprisingly triumphed in a four-team tournament that included strong Brazilian, French and Italian teams. Something to get excited about or merely glorified friendlies? These days the Confederations Cup is used as the warm-up competition for the World Cup, being staged by the host nation a year before the main act. But back in 1997 the French were left to their own devices and planned their own mini-tournament called Tournoi de France – more commonly known as Le Tournoi – similar to what had happened in England in 1995 with the Umbro Cup (played 12 months before Euro ’96) and in the USA in 1993 with the US Cup. Both those mini-tournaments saw England fail to beat Brazil and they would hope to make it third time lucky in France, with both sides joined on the guest list by Italy. There was no shortage of attractive opposition facing England out in France. Such tournaments serve several purposes. They are essentially trial runs for the following year, helping the hosts get a flavour for the real thing and offering the home nation a welcome chance to play something approaching competitive matches in a tournament environment. And for the other sides involved it helps in their preparations for the following year’s competition, both in terms of the tournament experience and making plans for 12 months down the line. England certainly did just that in France, manager Glenn Hoddle liking the The Golf Hotel in La Baule so much that he decided they would return there during the World Cup – provided they qualified. England headed out to the tournament in good spirits after winning a vital World Cup qualifier in Poland on May 31. The main game during the end-of-season programme had been won, now they could focus on Le Tournoi. The real pressure was off, but the next task was about showing England could compete with three excellent sides and using it as proper preparation for a year later. Hoddle was keen to stress there would be no repeat of the antics that had blighted England’s trip to Hong Kong shortly before Euro ’96, with the focus for the week-long trip to France on preparing for the real deal. England’s first game was in Nantes against Italy, who four months earlier had won at Wembley in a World Cup qualifier – the only blemish on Hoddle’s record so far. The return game would take place in October, so this was to be seen as the least important of the three meetings in a year. But what the game lacked it status it would make up for in English success. Hoddle rang the changes from the previous game but it was perhaps a measure of the depth of talent available at the time that such a different side could play with such confidence. And that was because England were blessed in terms of the players at their disposal compared to some other eras. Experienced men such as Martin Keown, Ian Wright and stand-in captain Paul Ince were joined for the night by a batch of young players from Manchester United who had won successive league titles. They would further prove to Alan Hansen that you could win things with kids, with one of them particularly instrumental to this triumph. England saw the game out to win 2-0 and it wasn’t just young heads who were getting excited by what had taken place. David Lacey, a veteran with The Guardian, wrote: “Glenn Hoddle’s highly experimental side blended a caucus of Manchester United youth with some Premiership wrinklies to produce one of the most stylish performances seen from an England team since Ron Greenwood’s side went to Barcelona shortly before the 1980 European Championship and defeated Spain by a similar score.” This was high praise. England fielded a more familiar-looking side against France in Montpellier, with senior players including Paul Gascoigne, David Seaman and Alan Shearer returning to the starting line-up. 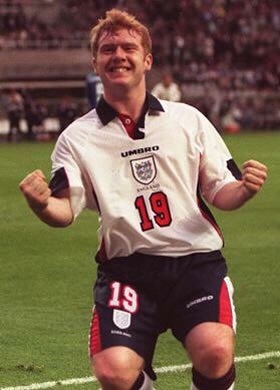 England’s performance lacked the sparkle of three days earlier, but it was still an encouraging evening wih captain Shearer scoring the only goal in the closing minutes as he pounced after Fabien Barthez spilt Teddy Sheringham’s cross. It was a notable result, given it ended a lengthy unbeaten run at home for the French. Alan Shearer scores a late winner for England against France. The friendly nature of Le Tournoi meant games were being judged as much on displays as scorelines by the media, but for those preferring to view this as a competitive tournament things were looking good for England. They had six points from two games, with France unable to catch them and Italy unlikely to do so given their goal difference. Only Brazil realistically remained a threat, as they prepared to face Italy ahead of playing England 48 hours later. If they won both then the world champions would pick up yet more silverware. But whatever happened it had been an excellent week for England. On Sunday, June 8, two unusual things happened. England’s cricketers went ahead in an Ashes series for the first time in more than a decade by comfortably beating Australia in the opening test at Edgbaston. And a short time later the nation’s footballers enjoyed winning a tournament with a game to spare, as Italy and Brazil drew 3-3 in Lyon to leave England four points clear with a game to go. For the first time since the 1983 Home International Championship, England’s seniors would win a tournament containing at least four sides. Paradoxically, England’s last game in Paris did not matter so far as the outcome of the tournament was concerned but was also their biggest, and arguably most important, test. Brazil were the world champions and widely backed to repeat the feat in France a year later. Although they had drawn both games so far at Le Tournoi, hints of their class and goal threat lingered and Roberto Carlos had scored a jaw-dropping free-kick in the opening game against France. If England looked distinctly second best against Brazil, then a bit of the gloss would be removed from an excellent end to the season. England were given a reminder of the scale of the task facing them 12 months later, knowing that in all probability they would have to beat Brazil at some stage if they were to win the World Cup. The result was fair but it hadn’t felt quite like the Brazilian masterclass of two years earlier when they turned it on to beat England 3-1 at Wembley to win the Umbro Cup. Even so, Moore wrote that the England players “looked suitably sheepish when they had to pose and parade with their trophy as We are the Champions rang out and the Brazilians looked on”. It was perhaps typical of England’s fortunes that, even in winning a tournament, there was an instant reality check. But even so, the sight of Shearer stepping forward to collect the unusual-looking trophy – that appeared to be designed by someone desperate to point out it was a football competition – was a pleasing moment, albeit a long way off the joy that comes with winning a ‘proper’ tournament. 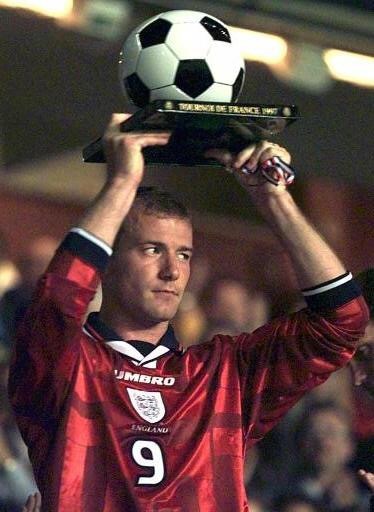 Alan Shearer holds aloft the tournament trophy despite England having lost to Brazil. We’re not going to overhype Le Tournoi and make it out to be the equivalent of England winning a major tournament, because it wasn’t. This was a one-off competition and the games could easily be dismissed as just glorified friendlies. It’s doubtful anyone in Brazil, France or Italy ever thinks about their failure to win it. But silverware has been thin on the ground for England in recent times and this contained surely the strongest set of opponents of any competition won by the team since 1966. The two victories achieved during Le Tournoi were pleasing, with the performance against Italy particularly hailed. Perhaps the other key significance was the contrast from England’s experience four years earlier at the US Cup, when they went there off the back of a painful World Cup qualifying defeat to Norway and followed it up by finishing bottom in the four-team competition and suffering a much-criticised loss to the United States. This time around they had enjoyed a precious qualifying win immediately beforehand and then given themselves a psychological boost by triumphing in the mini-tournament. The memories of Le Tournoi, amazing how time flies. Wonder how Hoddle would have faired with England had he not lost the plot with his comments.